“Nothing recedes like success,” said the British filmmaker Bryan Forbes, so now that the stars have boarded their jets and the carpets have been taken from Leicester Square, let us present you with some of the more unusual films from the 57th BFI London Film Festival. While Tom Hanks’ pirate spectacular Captain Phillips opened the festival, its nautical theme is shared by All Is Lost. The similarities end there however. In All Is Lost a sailor wakes to find a problem with his vessel. Alone, he staves off death for as long as possible as his strength and chances of rescue diminish. The film has almost no words, and its only character is a tough but aging Robert Redford as the resourceful, yet increasingly desperate, man adrift in the Indian Ocean. The action lies in his confrontation with impending storms and shots of him floating above schools of sharks swimming menacingly below. Otherwise the vessel simply glides over the ocean, giving us the spectacle of the cloudy daytime sky changing into the glitter of the stars and moon. 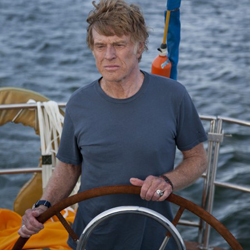 Against such vastness, Redford’s insistent struggle on his isolated lifeboat becomes a witness to human endurance. Our next film moves us from enduring solitude to the terror that we are not in fact unique, that someone else exists who is exactly like us, and what’s more, that this person is a good sight more popular and successful. This is the idea behind The Double, an adaptation of the Dostoevsky tale directed by British ‘gadget man’, Richard Ayoade. Jesse Eisenberg plays the nervy Simon James, like a character in his own anxiety dream, a functionary within a Kafka-esque bureaucratic dystopia. The late-70s kitsch of the location evokes an imaginary place between America, East Germany, and Ayoade’s own television spoof, Garth Marenghi’s Dark Place. It is the light, colour, sounds, rhythms and design that have life in this film, not the trapped Simon James who loses status, individuality and the attentions of shimmering co-worker played by Mia Wasikowska to his charismatic double, James Simon, with hellish consequences. Away from such caffeinated and frenetic offerings is the extraordinarily elegant Ida, a stripped-down historical drama set in 1960s Poland. The sparse action concerns an orphan who had been abandoned in a convent during the war. As a young adult about to take her vows she meets her only living relative, a suicidal alcoholic intellectual who informs Ida she is Jewish. 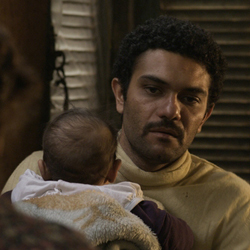 The film is a bare experience of distance between people and does not turn such revelations into grand dramatics. It feels instead like an imaginative recollection of the time and place of emigrant director Pawel Pawlikowski’s youth. The film is perfectly composed and rendered in graceful black and white, the intensity of the experience lying in its contemplative beauty. Grand Central is a rural French drama about a group of workers at a nuclear power plant. Daily they are exposed to the risk of toxic radiation, and this film, in the lineage of naturalistic drama, presents no peasant idyll but instead explores class and the dynamics of male relations. The energy is intensified by a violent sensuality that sparks when Gary (Tahar Rahim, who starred in A Prophet) begins an affair with a co-worker’s girlfriend. Containing too much dread and sickness to really be called a romance, the film, directed by Rebecca Zlotowski, offers instead an impressive study of a highly-wrought situation. The truly outstanding documentary of the festival was How We Used to Live, which puts together footage from London that runs from the first post-war years of austerity up to punk and the early 1980s. The documentary has no story or message to impart, but instead mixes a great wealth of archive footage that features the capital and its great diversity of inhabitants, all set to a soundtrack provided by Saint Etienne. Darting across spaces, times and subjects the film offers the spectacle of over three decades of change, from fashion to architecture, lifestyles to industry, consumerism, and urban life. There are so many more to mention, from Rags and Tatters, a film about an escaped prisoner in Egypt immediately following the days of Tahrir Square, to All Cheerleaders Must Die, a Buffy-style high-school comedy thriller about the undead (which I must say the audience enjoyed more than I did, although not being an American teenager, I didn’t quite feel I was the target audience). Many of the films at the Festival do not go on to receive national distribution, but the ones mentioned here have a good chance of appearing at a cinema near you in the UK. Look out for them.